Tsubaki KabelSchlepp is pleased to announce its newest product innovation, the TKA Series Cable & Hose Carriers. The TKA Series Cable Carriers are especially tight to reliably protect cables against dirt, chips and circulating spray water while also preventing ingress of coolants and lubricants. With the enclosed stroke system and pin-hole joint, even large amounts of atomized oil and flying particles no longer pose a problem during cleaning of the work area. This particularly high level of protection for the installed cables into the connection area was tested and confirmed in line with IP54 protection ratings. 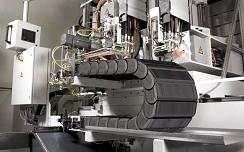 It is the only cable carrier worldwide to comply with this high protection rating. All TKA types are also available in extremely heat-resistant versions; the special material reliably protects the cables against negative effects, e.g. from chips with temperatures up to 850 °C. Other essential product properties are the optimized geometric shape of the chain links and a triple encapsulated stroke system which allows for extensive unsupported lengths while also being highly torsion-resistant. The well thought-out design and versatile performance is especially great for applications with debris and other particles flying around. The cables stay protected ensuring longer wear life. It can be used standing or hanging, and the dividers can be placed in variable arrangements, offering our customers a maximum scope of applications. Tsubaki KabelSchlepp’s TKA series is offered in multiple size ranges which are available for immediate shipment. 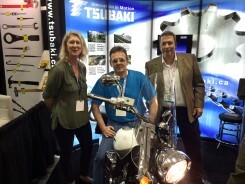 Congratulations to Arthur Feteke of NOV – Hydrarig for winning the Suzuki Bike from the Blue Thunder Contest held at the Global Petroleum Show in Calgary. The issue this mill was experiencing is premature corrosion on 81X conveyor chains due to the conveyance of wet Hemlock, which corrodes the chains after 2 months in operation. 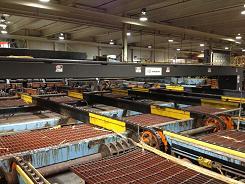 This results in significant maintenance and downtime approximately every 2 months for the mill. Tsubaki has been experimenting with a proprietary coating that can be applied to conveyor and mill chains to address corrosion issues in wet and/or caustic environments. This new formula was applied to a set of 81X chains and tested on this application to determine if more life would be achieved. The test proved to be a major success as life had increased from 58 days to 329 days resulting in a cost savings of $7,576.15. Tsubaki is currently in the process of analyzing the results of the test to determine if the formula can be improved to further increase chain life. With different industries all around the world, how do you know what is the right chain for any given application? There is not always one correct answer but many factors can play into making the best choice. In some instances money may be no object and in others it may be the only one. This can change the selection procedure and final product for use. There following are a couple examples of chains that have excelled in particular applications and some upgrades that could also be added to further increase chain life. 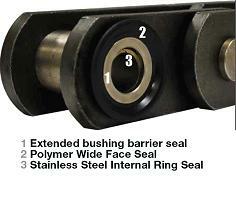 A big mover of bulk products within a cement plant are bucket elevator chains. These are larger engineering class chains that move product vertically from process to process. Buckets are attached to the chain and scoop the product at the bottom and dump them off at the top. These applications are notoriously dirty, dusty and abrasive. The use of a bushed chain without rollers is widely used as the elimination of a roller takes away an area where the abrasive product can cause wear and the need for a roller on a vertical lift is not really needed. Tsubaki uses high grade carbon or alloy steel to make these chains to endure punishing shock loads and abrasive wear. The addition of a barrier seal is standard on the 4000 series of cement mill chains and keeps abrasive product away from the pin bushing area to extend chain wear life. In plants where high humidity or corrosion is an issue the use of a hardened stainless steel pin can be used as an upgrade or the addition of SJ3 seals can further extend the wear life over and above the standard barrier seal. Packaging machinery needs chain that will yield minimal stretch and length difference between strands in order to properly index materials. The chains also need to stay clean and lubricated at the same time. Lambda attachment chain is perfect in this environment. Lambda attachments are available in all the same varieties as standard attachment chain and Tsubaki can also make custom attachments to suit the application if required. The Lambda bushing will produce enough lubrication to insure the chain is maintained properly while not contaminating the product on the line. 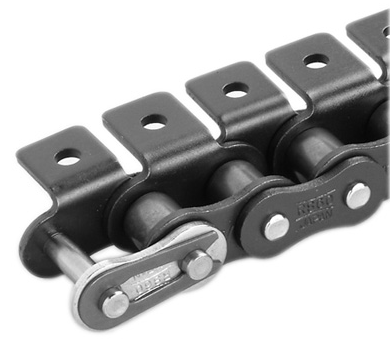 The chains are always lubricated ensuring a minimal amount of wear resulting in even and prolonged wear life. In very critical applications Tsubaki can also offer the chains matched and tagged to a specific nominal range as requested by the customer. To protect against corrosion Lambda attachment chain can also be supplied in nickel plated or our proprietary NEP formulation. Although other chains could run well in these applications there are alternatives that work better and further upgrades can help save money and down time in the future. When in doubt ask Tsubaki for a review of your application to see if we can get more out of it!